The CasITa-to-5k ran on the Veterans Parkway wood chip path last night. 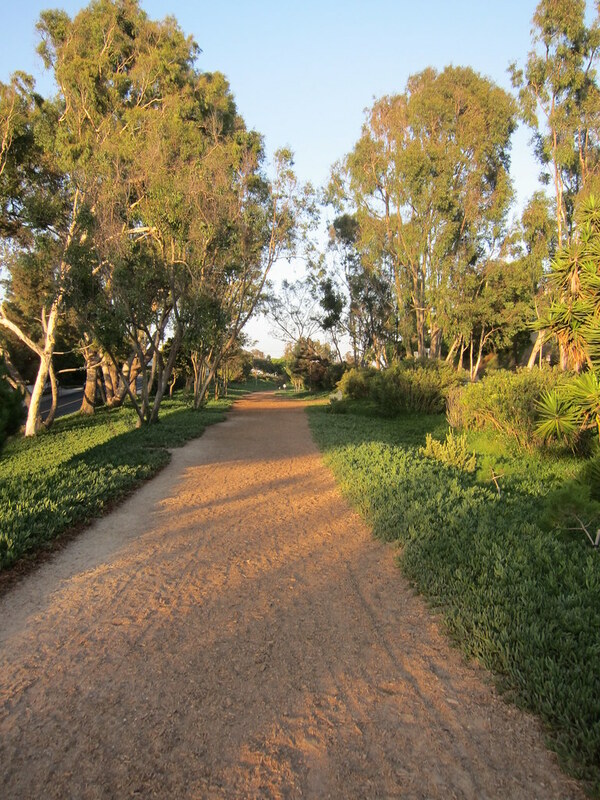 It was a beautiful Southern California evening for a run and the path was alive with walkers, pets on leashes, and runners. We started off with our usual brisk walk to warm-up and then moved into the intervals of running and walking. 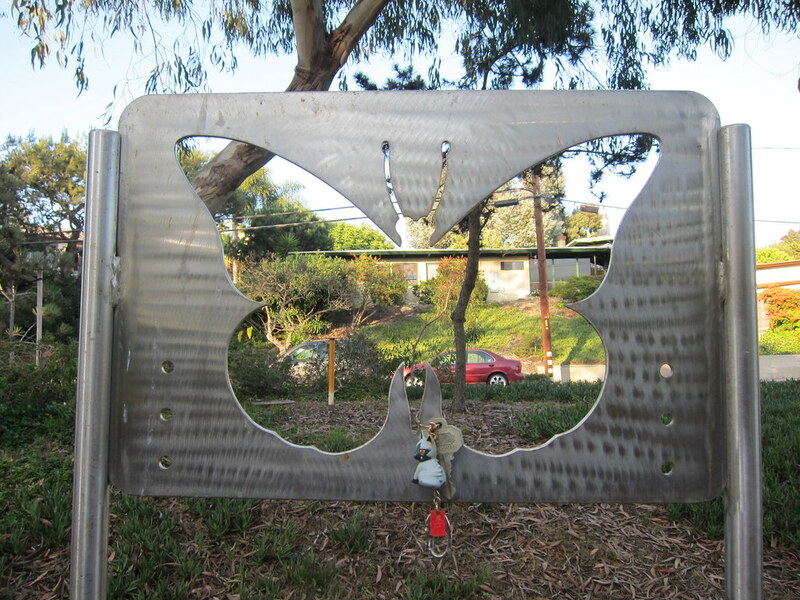 As we were running, we spotted a set of lost keys hanging from one of the The Mariposa Pathway Butterfly Totems. After our run, we drove down to the beach to catch a glimpse of the harvest moon. Yesterday marked the September equinox, also known as the autumnal equinox in the Northern Hemisphere. An equinox occurs twice a year and is when the center of the Sun is in the same plane as the Earth's equator. The full moon nearest the September equinox is referred to as the harvest moon. This year, the harvest moon appeared on the same night as the autumnal equinox - a phenomenon that has not occured since 1991 and will not happen again until 2029. As the summer sun set last night, its rays blended with the rising autumn moon to create a unique twilight. 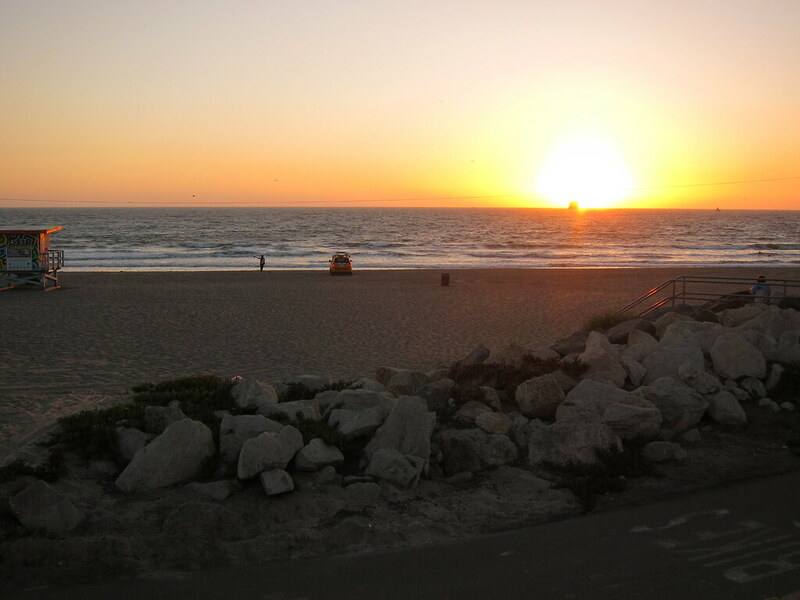 From the beach, only the setting sun was visible so we headed over to Sand Dune Park for a higher vantage point. At the base of the dunes, we looked up and caught a glimpse of the setting sun in the distance. We climbed the seemingly endless flights of stairs to the top, stopping periodically to catch our breath and admire the beauty of the full moon. 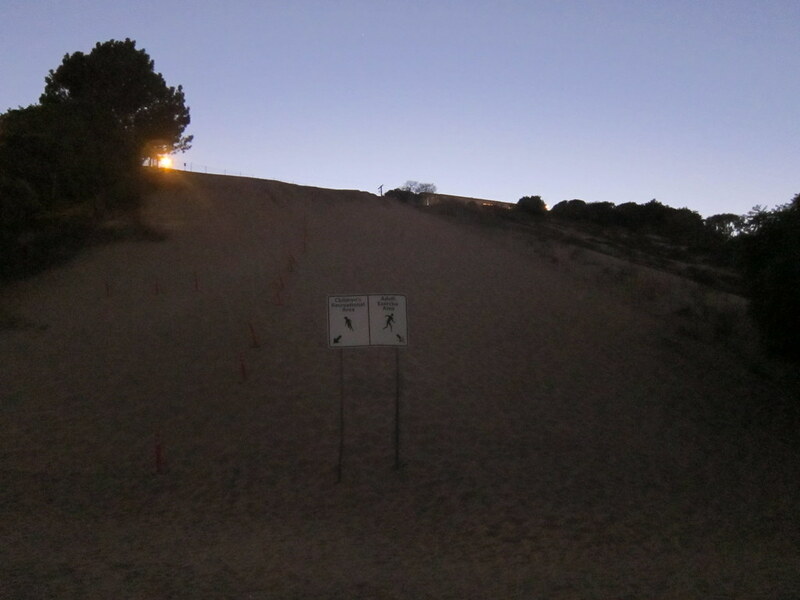 From the top of the sand dunes, we observed the changing colors of the round moon and the night sky. The Japanese believe there is a moon rabbit, also known as 月の兎 or Jade Rabbit, that pounds rice to make mochi. As we gazed into the twilight, I fixated on the dark shadows in the sphere and tried to envision a rabbit making rice cakes. My hubby started calling me skinny bunny after I lost 90+ lbs so anything with bunnies, rabbits, hares appeals to me. I swear I can see a bunny in the moon. It is a very happy bunny. And that metal mariposa is awesome. Lovely! I watched the moon as well last night. Our Spring equinox! I thought this was last night, but then realized that you posted Thursday night. My girlfriend mentioned that the sky looked beautiful that night when we were going out. It was cloudy, but there was definitely something different. Thank you for the pictures. I am half Japanese and my mother never told me this story. Now, I will have to ask her about the moon rabbit pounding rice into mochi. I like that. Looks like a nice peaceful run. I love the picture of the moon. So pretty! 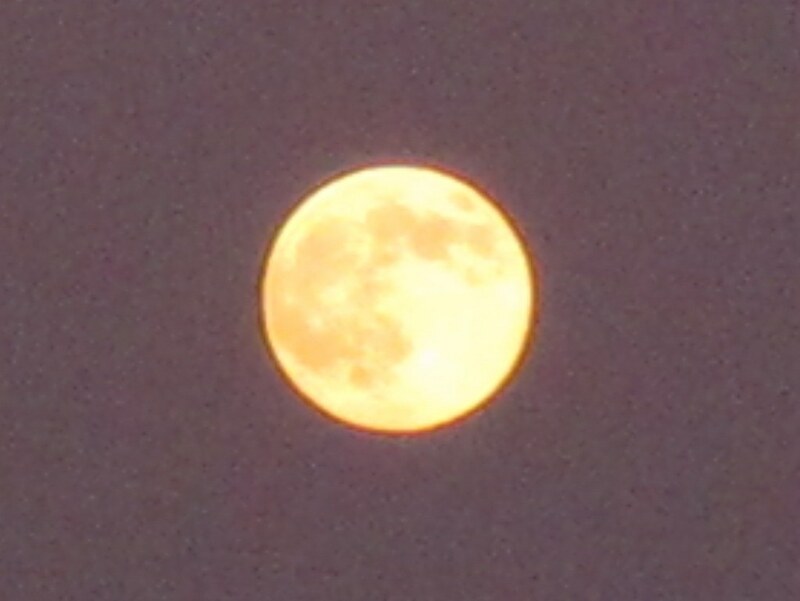 I didn't know that about the harvest moon appearing on the same night as the autumnal equinox doesn't occur often. I wish I would have known.